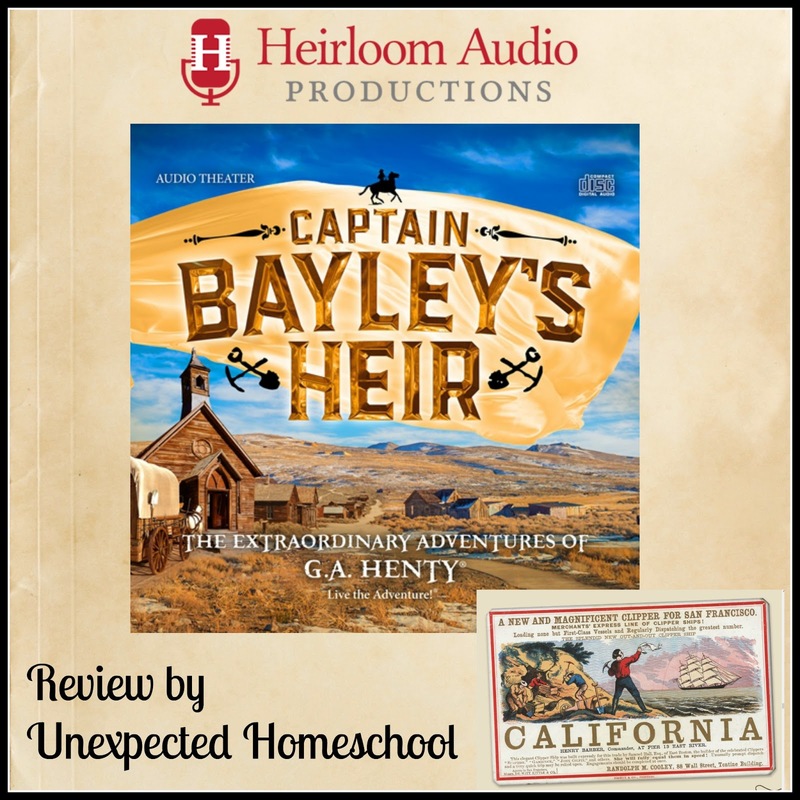 Heirloom Audio Productions has put out another winner in Captain Bayley's Heir! If you've been reading the blog very long at all, you know we adore these audio dramas. If this is your first time hearing about Heirloom Audio Productions, let me tell you a little bit about them. Through the The Extraordinary Adventures of G.A. Henty, Heirloom Audio Productions brings history to life by going the extra mile in their audio dramas. Nevermind there is not a video component - it's unnecessary. You will be immersed into the story world through the fantastic voice acting talent and sound effects. Very little is required for your imagination to fill in the gaps. We received the double CD set of Captain Bayley's Heir as well as access to all the extras for the production available through the Live the Adventure Club website. Through the website, you can organize all of your previous adventure purchases with extras, and listen to the audio dramas online too. Included in the bonus content are some very useful items to turn this audio drama into a complete study as well as some fun extras. 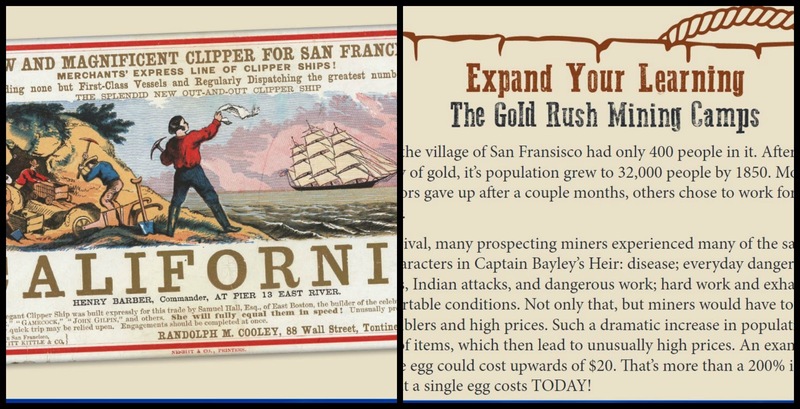 The e-book version of Captain Bayley's Heir by G.A. Henty that can be read online or downloaded. The Study Guide is available as a downloadable PDF file or can be read online at the Live the Adventure Club. It is a full color guide that provides Listening Well questions, Thinking Further questions, and Defining Words for each chapter or track. The Listening Well questions are basically comprehension questions to ensure your listener was able to follow the pertinent details. The Thinking Further questions give your student the chance to go a bit farther with deductions or looking up additional information. And the Defining Words are vocabulary words from the chapter that may not be readily known to your student. The Study Guide is formatted to make it easy to follow along, even through you are using audio tracks. Each chapter is titled while also listing the CD number and Track, along with the time stamps for the MP3 files. No matter how you are following along with the adventure, you can find the proper place in the Study Guide. Throughout the Study Guide are Expand Your Learning blocks that provide additional information that applies to the topic of the current chapter. It gives your student a little background history to make the story more easily understood while teaching a little history along the way. The end of the Study Guide includes a list of additional resources to continue learning, and three Bible studies on topics relevant to the story: God's Grace, Becoming a Christian, and Honoring Your Parents. 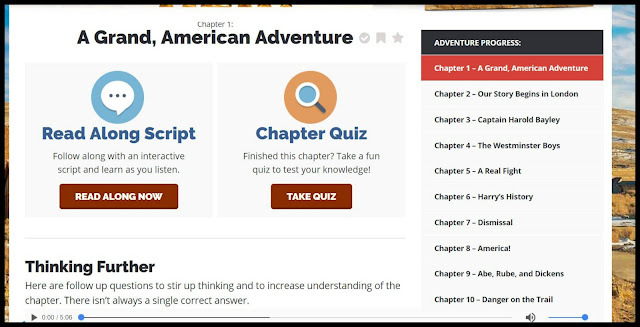 For those of you who don't want to download everything, the Live the Adventure Club website has an interactive way to use the study guide and script. It includes the Thinking Questions and Defining Words portions for each chapter along with a quiz. You can also follow along in the audio drama script, not the e-book, through a nice pop-up window. This is especially great for those who struggle with auditory only learning. Still, the audio dramas are so encompassing, that you almost don't even realize there is not a visual component. Our story starts in London, England with separate groups of people who meet through the rescue of a dog that has fallen through some ice. Harry, the owner of the dog, is a crippled young man who lives with his mother in rather strained circumstances. The other three young people, Frank, Fred and Alice, live with Captain Bayley and are all considered to be his heirs. Captain Bayley did have a daughter of his own once, but Ella was lost to him after a disagreement over the man she loved. After becoming friends, Harry warns Frank of a fight between street children and those at his school. However, the warning did not help in the end and a situation occurs where Frank is accused of crimes that will get him expelled and possibly anger his uncle, Captain Bayley. Feeling he has no recourse, Frank boards a ship for America where he plans to prove his worth and innocence. The adventure follows Frank through all his travels across the ocean, in a caravan that is attacked by Indians, and all the way to California where he and friends from the journey setup a claim to prospect for gold. All the while, Frank demonstrates honesty and care for his fellow man. Yet he still feels like he is missing something, even though eventually he knows he has proven beyond a doubt he can make it on his own. A former preacher that is working with Frank in California suggests that perhaps what he has been looking for is forgiveness from God. Meanwhile in England, it is learned that Harry's mother is not actually his biological mother, but found him in the arms of his dying mother in the street. She and her husband cared for Harry and his mother until her death and then kept Harry as their own, not knowing who his mother had been. But meeting Captain Bayley and his family opens up new information, when a crest at Captain Bayley's home matches the crest on a ring Harry's biological mother was wearing. It turns out Harry is the son of Captain Bayley's daughter Ella. Harry urges his newfound grandfather to reconcile and believe in his nephew, Frank. They set out for America to find Frank near death. However, Frank does pull through and eventually decides to return to England with his family. The true culprit of the crimes being revealed as Frank's cousin Fred, who then flees to America himself. This time around Amber decided to listen to the CD in her room while taking notes! It is a first for her to attempt this type of listening. We have reviewed quite a few of the Heirloom Audio Productions audio dramas utilizing them in an array of educational methods. Frequently I've asked Amber to follow along in the study guide, once or twice we used the study guide to its full extent. Other times she has simply listened and taken in the adventure being told. However Amber struggles with auditory processing and we are working on skills to make note taking from oral presentations easier. Amber chose to use the audio production of Captain Bayley's Heir as an opportunity to practice note taking on her iPad. The story summary from above, was actually derived from Amber's notes since I didn't get to listen to much of the drama. It took Amber three listening sessions to finish the audio drama, and she enjoyed all of the time she spent with it. Unfortunately, this time I didn't get to join except for a few minutes here and there. She ranked this production up with the most recent one, In the Reign of Terror! If you understood her fascination with the French Revolution, then you would know this was high praise indeed. 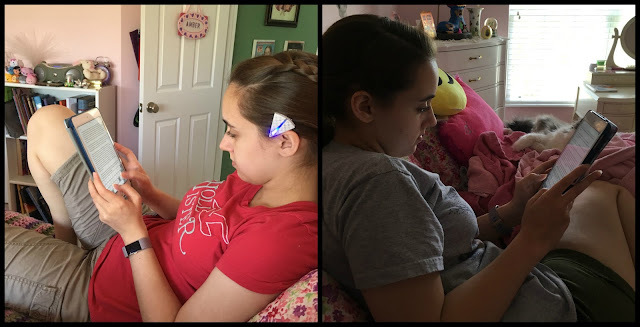 Still, this audio drama fit right in with the U.S. history Amber is studying this year, so it was a perfect way for her to continue with her history studies while practicing her auditory skills. Other members of the Homeschool Review Crew also reviewed Captain Bayley's Heir. Please follow the link in the graphic below to read their thoughts.